The Mario Stadium Grass court. Mario Stadium is a tennis court that appears in Mario Tennis Open as the holder of the traditional Grass, Hard and Clay tennis courts. It is one of the many courts playable from the beginning. It is a starting court, like the Peach Dome courts in its predecessor, Mario Power Tennis. 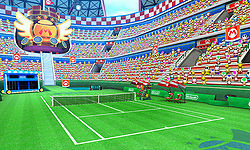 Mario Stadium is where basic tennis courts such as the Hard Court, the Clay Court, and the Grass Court take place in. As mentioned before, all these courts don't need to be unlocked. Like all stadium courts in the sports series, the crowd appears with Toads, Shy Guys, and Koopas cheering on the players or teams. The Ink Showdown Special Game is also played in Mario Stadium. All three courts appear in the final World Open tournament, the Champions Cup. The Hard Court is used in the starting round, the Clay Court is used in the semifinals, and the Grass Court is used in the finals. "Tennis aces face off on this famous court." "A legendary court revered by top players." "A legendary court known for high drama." The Mario Stadium Hard Court. The Mario Stadium Clay Court. This page was last edited on June 10, 2018, at 07:55.